After reading her latest book, Fascism: A Warning, I think we should all be worried. And not just about Donald Trump. 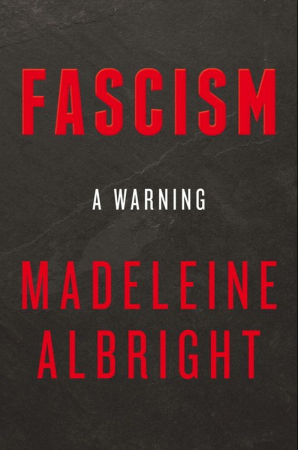 In this book, Albright examines the origins of Fascism in the 1920’s and 30’s with the rise of Mussolini and Hitler. Then she takes us on a round-the-world tour, surveying autocratic or autocratic-leaning countries including Russia, Turkey, Hungary, Venezuela and North Korea, looking at the conditions and the leaders driving each of them down the path to Fascism. Her warning is mainly about America. That’s the subject of the final chapters of the book. Fascism might be hard to define because it doesn’t have a universal end-goal, unlike Communism. Albright even suggests Fascism might be more a set of behaviors for seizing and maintaining dictatorial power than a political ideology. Fascist leaders have often been charismatic, sometimes building a cult-like following. They show no respect for democracy or for democratic institutions like a free press or an independent judiciary. They actively and often violently suppress any opposition. Fascists undermine democracy using democratic means. Hitler and Mussolini both exploited weaknesses in their respective democracies to rise to power. Once in power, they subverted democracy by suppressing and killing opponents, and by destroying competing centers of power like independent media. Albright shows us similar events happening in other countries. You can see it unfolding almost daily in places like Turkey where President Recep Tayyip Erdoğan, first elected democratically in 2002, has become increasingly autocratic, especially since a failed coup in 2016. Fascist leaders enflame and thrive on resentment. Humiliating defeats in World War I provided receptive audiences for the rhetoric of Mussolini and Hitler. Restoring Russia’s power and influence following the collapse of the Soviet Union has been one of Vladimir Putin’s overriding goals. Hugo Chávez came to power in Venezuela following two decades of mismanagement that left its economy in ruins. Slobodan Milošević roused Serbian anger at past military defeats by the Ottoman Turks and the Nazis to help him seize power in Yugoslavia. They claim to speak for a single ethnic, religious or racial group. Whether it’s Aryans in Germany, Magyars in Hungary, or Serbs in Yugoslavia, Fascists elevate one group at the expense of all others, show no respect for minority rights, and make no attempt to collaborate with anyone outside their base. Many writers have called attention to the ways that globalization, technological change and mass migration are straining western democracies – economically, socially, and politically. Albright’s warning is that these strains can create the conditions for Fascism to take root almost anywhere. You don’t need to read this book to see signs and omens of Fascist tendencies in Donald Trump’s behavior. He attacks the media, the FBI and his own Justice Department. He incites resentment against foreigners, claiming immigrants are criminals and trading partners are cheaters. He panders to his white male base. Albright is highly critical of Trump throughout the book. As much as she criticizes Trump for undermining American democracy, Albright is equally concerned with the impact he is having globally. She argues that Trump’s behavior is “catnip” to autocrats and dictators. If Trump accuses U.S. media of always lying, how can we criticize Vladimir Putin for saying the same thing? If he talks about locking up his political opponents, how can we protest when dictators elsewhere actually do lock up theirs? 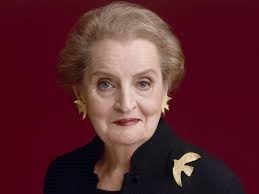 Madeleine Albright is first and foremost an American diplomat. She believes that America is the “indispensable” nation, that it has a special role to play in the world, and that its President has a special duty to advance American values at home and abroad. These beliefs permeate her book. They might be old fashioned but in today’s climate I find them refreshing. I enjoyed the many stories of her own family and career that she’s woven throughout the book. It’s striking how much of her autobiography has been touched by or directly involved in key historical moments of the last eighty years in both Europe and America. That said, I could have done without the occasional burnishing of her own track record, especially in comparison to the administration of George W. Bush, such as on North Korea. In person Albright is more engaging, humorous and self-deprecating than in writing. I hope I’m as articulate, clear-headed, and funny at 83 as she was that evening in Seattle. There are hints of this in the book, for example, when she refers to herself as “a former somebody” but overall her tone is far more serious, as the subject demands. Albright describes herself as “an optimist who worries a lot” and she wrote this book because of the worrying signs she sees around the world. I think Fascism: A Warning is required reading for anyone concerned about what is happening here in the U.S. and anyplace else where democracy and democratic values are under attack. On one fundamental point, I disagree with her. I think Donald Trump is a Fascist, and I think this book proves it. (Perhaps Albright, ever the diplomat, has tempered her conclusion.) He meets almost all the criteria listed in the book. While he hasn’t used physical violence to suppress his political opponents, he certainly appeared to condone it during several of his 2016 campaign rallies. And no one is spared from his indiscriminate verbal violence. The question now is how far will he get? Here I think there’s room for cautious optimism. The U.S. has a deeply rooted democratic culture and strong constitutional safeguards against tyranny. And Trump himself is so undisciplined and mercurial I question whether he could execute a long-term strategy, if he even had one. However, we must not be complacent. There are indeed worrying signs. This entry was posted in Books, News and politics and tagged book review, book reviews, books, democracy, Donald Trump, fascism, foreign policy, Madeleine Albright, politics, trump. Bookmark the permalink.